What is the goal for your podcast? Some home business owners podcast to compliment their existing business. For others, the podcast is their home business. Or maybe your goal is simply to have an online radio show as a hobby business. All are acceptable, but your end game goal will dictate some of the decisions you make along the way. Who are you podcasting for? This is where target market comes in. Like any other home business or marketing strategy, you’ll save yourself a lot of time and money if you hone in on a market that wants what you’re offering. Name your podcast. Coming up with a show name is one of the most important tasks, so take time to do it right. In many ways, it’s similar to naming your business, in that you want a memorable name that describes the nature of the show. If you’re podcasting along with your current home business, you’ll want to maintain your brand, so you’ll want to include your business name in the show. Create graphics and a website for your podcast. The graphic will be used on podcast directories, as well as show up on your listeners devices. You also need a hub from which to share and promote your show. Many podcasters use WordPress to create their website because there are some great podcast related plugins, but you can use any option that gives you a professional web presence. Software to record interviews. If you’re doing a solo show, there is no need for this, but if you want to record Skype calls, you’ll need a third-party software that will record the call. Some options include Pamela for Skype (Windows), ECamm (Mac/iOS), and MP3 Skype Recorder (free). Audio editing software. A long time, affordable (as in free) option for podcast editing has been Audacity. Mac users have Garageband standard on their machine. 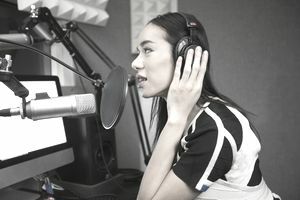 There are other audio editing options as well, but you’ll want to find one that allows you fix sound issues, cut segments, and add elements (i.e. your intro and outro). Another option is to outsource audio editing. If you’re doing a video cast, you’ll want the same elements except it should edit video. Find a hosting service. Audio files are large, so you need a place where you can store it, and also, get playback options you can embed onto your website. Libsyn and SoundCloud are two of the most popular options. Podcastwebsites.com offers a single place for everything (website and podcast), if you like simplicity. It’s pricy for the beginner, but there are no limits on storage or bandwidth, which can jack up the price of podcasting with some other options. When choosing a service, consider whether or not they can distribute your show to iTunes and other popular podcast sources. You can do this yourself, but it’s a nice feature of the host can do it for you. Edit your show. Colin Gray has several YouTube videos on using Audacity to edit podcast audio. If you’re using a different software, follow the instructions for editing. Your goal is to level out sound, improve sound quality, reduce static and other sound issues, and slice together your show segments. Embed the show on your website. Most hosts will give you a code that allows people to hit play and listen to the show right from your site, or to download if they’d like to listen that way. The best way to do this is to have a blog post about your show, add the code, show notes, and any other information that goes along with the show. For example, if you interviewed an author, you can add an Amazon affiliate link to his book. Or if you mentioned resources on the show, you can include links to them. Add your show to podcast directories. The most popular are iTunes, Stitcher, and SoundCloud. You’ll need to apply and be approved before your show will be available. Share your show on social media. Include information about your show in your email newsletter. Affiliate marketing. Just like you can use affiliate marketing to make money from a blog, so too can you from a podcast. The trick to affiliate marketing on a podcast is delivering your unique affiliate URL. If you use WordPress, you can use the Pretty Link plugin to create easily spoken URLs with your domain name that will direct listeners to your affiliate product. For example, if you want to promote the book “Amazing Acme Tips,” you can get the affiliate link from Amazon, and then create a redirect from your website to the book. That way you can tell readers, “To pick up your copy of Amazing Acme Tips, visit mydomain.com/amazingacmetips,” and your redirect link would then take the listener to the book on Amazon. Sell your own product or service. Podcasting is an excellent option if you create a product or service targeted to your podcast listeners. For example, if you have a bookkeeping service, you can have a podcast on bookkeeping secrets for small business owners. You can use the show to share tips, but also, share your expertise and services. Podcasting works well for generating clients for coaches and consultants, as well.